The advent of high-deductible health plans, along with their companion payment vehicles known as Health Reimbursement Accounts and Health Savings Accounts, have put the patient back into the realm of medical expense billing. This means that radiology practices are seeing an increasing percentage of their reimbursement for services coming directly from patients rather than insurance plans. Well-managed practices are reviewing and fine-tuning their customer service policies and procedures as they relate to patient billing and collections, including those functions executed by outsourced billing vendors. The customer-relations process begins even before an appointment is made, when the patient calls seeking information about their upcoming examination. Knowing that they will be responsible for some portion of the payment, patients today are shopping for the best balance between price and quality, although price might be higher on their priority list. Imaging center phone staff must be adequately trained to handle questions about price, insurance participation, and the possible payment arrangements. Check to determine if your radiology scheduling software facilitates the use of such data in any way. Best practices in patient billing dictate that the optimal time to obtain insurance information and reach an understanding with the patient about the cost and responsibility for payment is at the time the appointment is made. The old-school thinking in medical offices was to avoid discussion of payment with the patient, so for some offices, this new approach will be a cultural shift. It’s time for medical practices to catch up to the rest of the business world where it is rare for a product or service to be obtained without immediate payment, or even an expectation of learning its cost. In order to facilitate the process, it is essential that the patients understand, to the extent possible, the amount they will have to pay after their insurance coverage. HAP often recommends an online patient cost estimator tool for its clients that enables patients to accurately calculate their potential payment responsibility for services rendered, factoring in their payer/plan fee schedule. This tool helps alleviate the need for the front office staff to use multiple sources to determine patient eligibility and out-of-pocket cost. As patient consumerism increases, the demand for and value of such a patient cost calculator tool is increasing, so it is worth asking your revenue cycle manager or vendor about how to deploy one on your practice website. Once the potential out-of-pocket balance has been determined, speak with the patient about making payment in advance. Some practices are using a credit card reserve system in place of an actual payment at the time of service. The credit (or debit) card information is obtained by the practice at the time of service and then the charge is put through once the insurance company has processed the claim and the balance is known. This process works not only with the patient’s own account but also with Health Reimbursement or Health Savings account cards. Many credit card processors will allow the cardholder to place a cap on the amount a vendor can charge to their account and then notify the patient by email or text message before the charge goes through, just in case they no longer wish to authorize it. Setting such a limit at the estimated amount of the charge will help the patient feel more in control and comfortable with the arrangement, but still allow the radiology practice to obtain prompt payment. Inevitably, there will be uncollected balances remaining after insurance payments and the practice will have to reach out to the patient for payment. 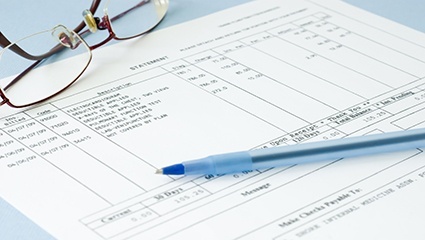 Accounts receivable follow-up activity can be automatically executed based on a pre-defined schedule. Today’s standard for accounts receivable processing is to use an automated phone call to the patient as the second cycle of contact 30 days after the initial statement. Automated outbound patient calls should be made during the call center hours of operation in order to enable direct transfer to an agent should the patient desire. On the third cycle, the contact would become a ‘final notice before collection.’ This process can be customized to meet the needs of your practice, pay class mix, and individual third-party payers within a pay class but it should be well defined and run over a relatively short period. The end result is an increase in cash collections while simultaneously reducing bad debt. As an added benefit, the automated calling system records the fact of the call, so in the event a patient disputes that the call was placed the practice can easily provide the documentation of time and date. Utilizing technology across the patient experience is absolutely critical in order to meet and exceed their expectations – which continue to rise as patients become more involved in the healthcare purchase process. Payment options today must encourage electronic payment opportunities such as telephone and online access. Accepting payments over the phone can include the use of Interactive Voice Response (IVR). Additionally, the radiology practice should provide an online patient payment portal that is accessible from any device. Both of these will facilitate credit card or electronic check processing of patient due amounts or balances. Patient responsibility statements must contain information about all of the available payment options, including a website address for the online portal. In fact, some experts are advocating the elimination of payment stubs and mailing envelopes from patient statements in order to encourage telephone or online response. The patient payment portal should give patients the ability to pay their balance in full or to set up a payment plan within a pre-defined set of limitations, including a minimum first payment and a maximum number of months to payoff. This option speeds cash receipts and decreases the necessity for staff intervention into the process. Although some practice owners may argue that the fees for electronic processing are too high, it is easy to show that the practice will be far ahead by collecting more of their balances more quickly even after the fee is factored in. Electronic payments have the added benefit of saving on the cost of paper, as well as significant internal time for handling mail, posting the payment into the system, creating a deposit, and taking it to the bank. The bank makes electronic deposits available sooner than paper deposits, and there is no possibility of a check being returned for insufficient funds (which can carry a hefty bank fee). Patients desire the convenience of electronic payment and a practice that refuses to take electronic payments might actually be at risk of seeing its patients seek services elsewhere! Introducing patients to the portal can be done by email when the patient’s address is collected in the system at the time of registration. The portal will allow the patient to elect to receive billing information such as statements by email rather than postal mail, which will speed up the process and save money for the practice. Some systems have the ability to utilize text messaging if the patient desires. When there is an insurance payment problem, accounts receivable representatives must contact the patient to inform them of the issue, to elicit their cooperation and assistance, and to remind them of their responsibilities. Rather than simply mailing a statement or balance bill to the patient indicating that there was no insurance payment, which often takes weeks to months to resolve, the practice can incorporate automated outbound calling to target eligibility denials. These calls can return an impressive 20% transfer to agent response on initial contact, enabling immediate rebilling of the account with the new insurance information. An awkward situation can be created when a patient with an unpaid balance wants to receive further services from the practice, especially when the balance is of a significant size and age. Just as with the initial encounter, best practices in customer service dictate communication with the patient in advance. The patient registration system should indicate open balance information and the practice should put protocols in place to determine the action to be taken at various levels. Careful training of the registration staff, along with scripting of their requests to the patient, will enhance both the level of collections and the patient’s satisfaction with the practice. The office’s registration system might not display balances that have been sent to a collection agency, however, since these are typically removed from the practice’s books. In this case, some practices review their upcoming appointment list for patients with collection agency balances and contact them to work out payment. Unfortunately, services might have to be denied if the patient refuses to make payment but it is unusual that the patient would not try to settle the account in order to continue to receive their needed procedures. The traditional methods of conducting business have changed in the 21st century, but healthcare has been slow to adapt to the trend. Radiology practices have to evaluate their current processes to be sure they are meeting the needs of their patients not only at the clinical level but also in their business relationship. Electronic access to billing information and the availability of electronic payment processing have to be emphasized as a way not only for the patient to easily settle their accounts, but also for the practice to speed collections and streamline its business overhead. Healthcare Administrative Partners empowers hospital-based radiology practices and imaging centers to overcome the challenges of the modern healthcare economy. Subscribe to our blog to receive our latest advice on radiology practice revenue maximization and compliance risk reduction.